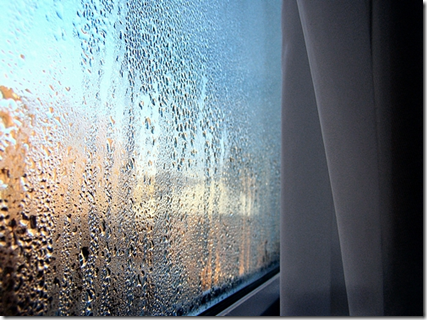 You are here: Home / Damp / Condensation / A word on Relative Humidity……(in houses). 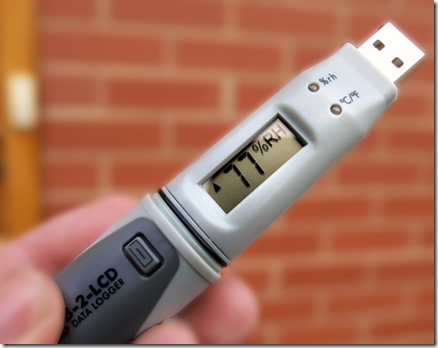 A word on Relative Humidity……(in houses). I though it would be useful to recap some general information on environmental measurement, as it relates to condensation diagnosis and control; for those who may not deal with these issues in such detail. Grams per kilogram – meaning grams of water per kilo of air. This is the method which most drying companies use, because it’s easier to calculate the amount of water which needs to be removed from a building; how many air changes are needed to achieve that; in a given space of time; using a particular factor for the performance of the drying equipment. There are merits for both methods, but for our purposes, we’ll use the following; swopping around these values can get a bit confusing and I’ll be referencing BS5250: 2002 ‘Control of condensation in Building’ which uses these measures and we need consistency with that. 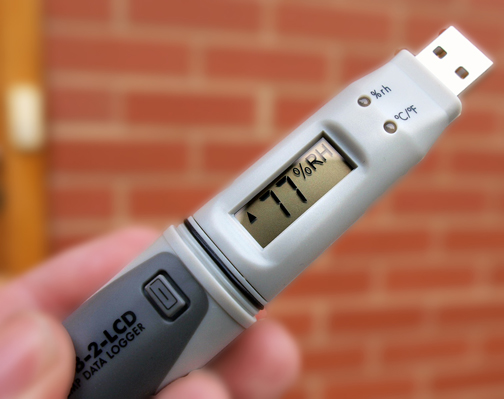 We’ll express Relative Humidity as RH% and the specific amount of water vapour in the air as Vapour Pressure; in kPa. So RH% is relative. It is relative to the amount of water vapour a given body of air can carry at a given temperature. Warm air can accommodate more water vapour than cold air, so the RH will rise, as air cools and fall as air warms…even if the actual amount of water vapour remains unchanged. I attended a seminar recently where a speaker was showing a series of slides to a paying group of Chartered Surveyors, showing a damp house. My interest waned when he exclaimed that the RH was over 75% in the basement and only 65% at ground floor level – implying the basement was damp. The RH in this circumstance proved no such thing; it could merely be a bit cooler in the basement….his measurements did not tell us anything. Had he measured air temperature and calculated the Vapour Pressure, he could have demonstrated the real difference in the amount of vapour in the air. Vapour in air, takes up volume and so increases the pressure. It’s rather like the water molecules are ball-bearings, poured into a bucket; air which was in the bucket would be forced out – exerting pressure. These water molicules are excited and are rushing around bouncing off the walls, so pressure is higher depending on how much water vapour there is. Imagine that a given body of air is a bucket. This bucket is sensitive to temperature and shrinks in the cold, expands when it is warm. Let’s say that today we have this bucket half full of water. It is 50% full. BUT, the bucket shrinks and expands all the time, at the whim of the temperature, so although it is 50% full now, it could be 25% full as the day warms, yet still have the same amount of water in as we started with. As night falls and the bucket cools it could end up 75% full, because the bucket has shrunk in the cold. If it gets really cold, the bucket could end up full to the brim; 100% full and overflowing – this is the Dew Point – and we have overflow – otherwise known as condensation. Thus we have a wide RH% range – with only the temperature effecting the % we measure. We’ve even got apparently dry conditions at one time and water streaming down the windows at another – yet the amount of water in the air is constant! However, we find that when we are not looking, A little kid is sneaking in behind our backs and adding water to the bucket. So when we measure the RH% we cannot tell if the rise in RH% is due only to the shrinking bucket or not. What if the temperature has remained the same, yet the RH% we measure has risen? This is why RH% is useless when quoted alone. It always relates to temperature and without both measures we are not seeing the full picture and can get confused. So, now that we have the RH and the temp, we can calculate the true position; how much of the effect is temperature derived and crucially, how much is due to addition or subtraction of water vapour. 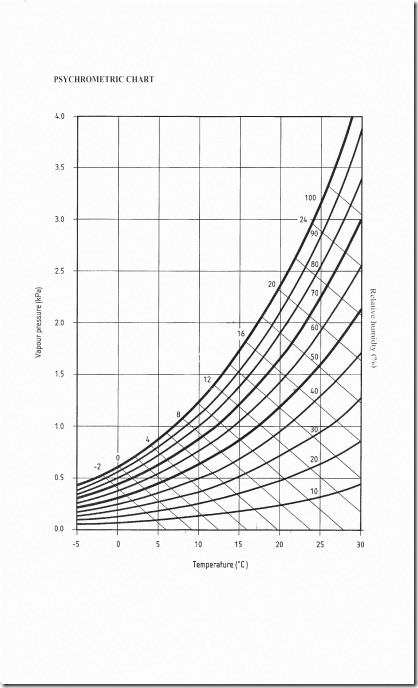 For this we need a Psychrometric chart. The chart below is from BS5250 (with permission – you should get this standard if you are a professional and want the full picture). 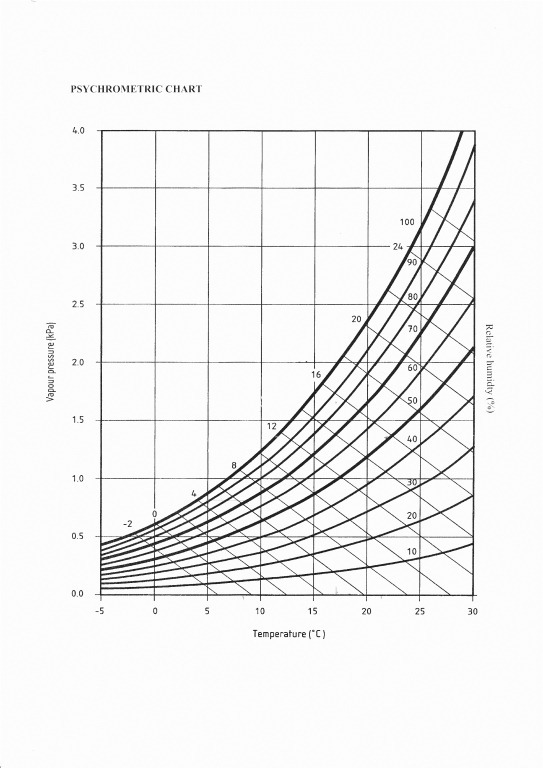 The chart’s essential because the relationship between RH and air temperature is not linier, so the mass of curved lines is the result. These allow a simple reading to be taken, starting with the air temperature and reading vertically up the RH% curve: By drawing a horizontal line across to the left we can read the Vapour pressure…in kPa. Bingo, we now have a figure we can rely on – this is the actual amount of water vapour in the air. If that cheeky kid has added water when our backs were turned we can see that the VP has risen, not because the air cooled but because the water vapour has been added to (if you are bored or just need to know, you can also read off how much cooling is needed to cause condensation at the current time and how much heating would be needed to lower the RH% to a given level). Now that we can measure the VP we can also make some comparisons to the VP inside the building and outside the building. Modern houses are very badly ventilated and this is getting worse. Thus, all the water vapour produced by breathing, washing, cooking, drying clothes and such, raises the VP, so it is almost always higher inside a house than outside. BS5250 handily provides some guidance on what these differences ought to be, and when the levels in a house, as opposed to outside, are considered ‘dry’, ‘moist’, or ‘wet’. These ‘occupancy’ levels are a useful guide when interpreting our figures. I hope the above makes sense. I pick up my data loggers from the York job next week and I’ll blog some figures then, with a bit less waffle about the above. PS – A special thanks to Graham Colman and The Property Care Association, without whom I’d still be quoting RH% in absolute terms. 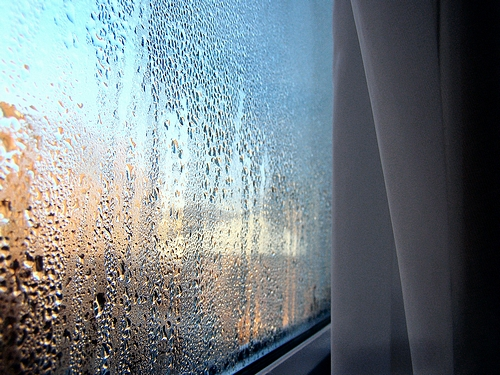 Visit here to book a place on the PCA Condensation & dampness in buildings workshop – I’ve attended twice, taking staff with me – Graham Colman & Steve Hodgson will fill in all the blanks for you. I have been on Graham colemans damp and timber course, money well spent, what he doesnt know about damp and timber isnt worth knowing. I don’t understand how the vapour pressure (in kPa) can tell you how much water there is in the air. Surely you would need to know the Humidity Ratio (grams of water/grams of dry air) to get a direct value of water in the air. Thank you for this very interesting point. Well that depends on how you want to measure it. You are right that if we want to use Specific Humidity we are expressing the ratio of water vapour to dry air as grams. This varies with vapour pressure so the two ar just ways of expressing the same thing really, though there’s reasons why you would use both. The reason I use Vp and not SH is so that we can compare results with BS5250, which uses vapour pressure. When Vp falls, so does SH and when Vp rises so does SH. You can use the Psychrometric chart produced by the national flood school to calculate either, though the Protimeter MMS also reads this. The drying guys then have a protacol based on air changes so say 1.5 litre per hour @ 1ACH. They can they increase Temperature ACH or a combination of both to increase the speed. Nice to know somebody pays enough attention……The condensation course being held later this month touches on this, but there’s more to be gleaned down at the flood school too. I’ll probably end up using both, the VP for BS5250 purposes and specific Humidity to help the client understand. They’ll probably understand g/kg better than kPa. I have just set-up my 2 data loggers to record to work out my vapour pressure differential in order that I can check my house against the humidity occupancy figures in BS5250. I have set the loggers for 1 hour intervals and placed one outside (north under flower pot), the other is on a bedroom cupboard (north side of house). I have put them both on the north side of the house for more even temperature and humidity readings. How long should I leave the loggers? I’d say that at this time of year it will depend. If you can leave them for long enough to be sure you are in the Autumn good and proper you will see the change in them. They are not that useful in summer because windows and doors are open so much and there are lots of good ‘drying days’ where washing is out on the line. Come persistant grey days, all that changes and that’s when the Vp differentials reallty start to show. I’m off to the Propery Care Association Northern regional meeting today with Graham Coleman and Steve Hodgson – preservationb expert overload! Thanks, it makes sense to leave it for a while. I haven’t forgotten the CSRT overview. I’m so busy at the moment I’m working night and day, sorry.